Located in Calabash, North Carolina this secluded Myrtle Beach golf course provides the ultimate golfing experience. Meadowlands, is known as one of the most rewarding and challenging golf courses along The Grand Strand. Golfers looking for a course playable no matter your skill level will often add this course to their list of courses to play. Meadowlands’ designer, Hale Irwin had the drive to develop the course through his expertise and passion in golf. Hands down…Meadowland offers one of the finest golf experiences along the Grand Strand coupled with spectacular golf deals! Age–old hardwoods, rolling landscape, crystalline lakes, and five sets of tees provide golfers with a charming and relaxing day of golf. Meadowlands is recognized as one of the most women-friendly course on Grand Strand. Like many North Carolina golf courses, sandy bunkers and water hazards are the primary face-to-face challenges. Players looking to improve their putts and short game, often fine-tune at the practice facility. The course features an attractive clubhouse, fully stocked pro shop with the latest golf equipment, and a grill serving tasty dishes and icy beverages. The friendly staff delivers exceptional customer service and golf tips. Players enjoy the course layout, making this one of the most highly played golf courses in North Carolina! 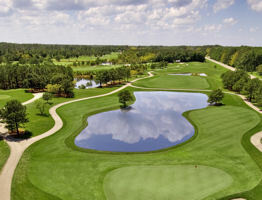 Book your Myrtle Beach Golf vacation and include this renowned North Carolina golf course. Your golf discount can be unlocked now, play championship Myrtle Beach golf courses and golf in North Carolina. Nice layout, friendly staff, great place of play and the course was in great shape! We’re in Myrtle Beach since 3 weeks and it’s the first round we’ve played on dry fairways. Staff was very Kinderhook and even if we played an afternoon round the pace of play was perfect. Nice people at the course. In the pro shop and at the carts. Course was very challenging. Great round of golf. Cart path only, cant fight mother nature. Will definitely try next year when the course dries out a little. Great course layout. Wet .. cart path only. It is still wet in spots, but overall a nice layout. Great golf course, great staff, great people you meet to play golf. Lots of rain, yet the course was in good shape. Greens have some bare spots and more crabgrass than you expect for a supposed high quality course. Kind of ragged around the greens. Very friendly staff. Course was in great shape considering the recent weather conditions. It is on my lists of courses to play again. Great play with well manicured fairways and greens...the staff was polite...I booked online and saved around $15 rather than calling for a tee time. Very enjoyable playing the course. Good conditions for the heat so far this summer. Would play this course again. Great track and fun to play. Will definitely return and play again. Staff was great. This is a great golf course. Great fairways, bunkers and greens. Nice people and good food as well. I Played tthe Meadowlands again today (1 week later) for a great price and the course is still in great condition. If I could give it more than 5 stars, I would. The people working here are very friendly and helpful. Located in Calabash, North Carolina this secluded Myrtle Beach golf course provides the ultimate golfing experience.